In the weeks since the successful passage of the bond referendum to fund the new library and events center, we have been busy planning an incredible Summer Reading Challenge series of activities and programs that will ignite the imagination for people of all ages beginning in June. We’ve also been working with the City and planning the next steps in our journey to a 21st century library. But before we move too far ahead, we would like to look back and say THANK YOU to all who worked so hard over the last several years to bring us to this point in our journey to a new facility. We are deeply grateful to all of the voters who shared our vision of Winter Park as a world-class city with a world-class library and courageously voted to fund it. Thank you for your trust. We said that we believed that our community had the courage to move forward with this bold project, and you proved us right. We also appreciate all of those who thoughtfully considered the bond referendum and took the time to fully explore the issue, but who ultimately decided to vote against it. We have heard your concerns and continue to welcome your input as we move forward. Our goal is that when the doors to the new library open in 2018, you will ultimately be proud and well served by the new facility. The volunteers and advocates who formed the Yes for Winter Park Library – Parking – Events Center advocacy committee. Their contributions to the campaign in terms of time, effort and funds were crucial. A special hat-tip to Jeffry, Martin, Jan, Gary, Nancy, Daniel, David, John, Mark, Thad, Dan and Nikki for their leadership. • To all of the individuals and organizations who publicly endorsed the referendum, especially the Winter Park Chamber of Commerce, the Park Avenue Merchants Association, Orlando Regional REALTOR® Association, The Park Press, Winter Park-Maitland Observer, Stephen Pategas, Kevin Ratigan, Joie Cadle, and Thad, Mary, Bob, Barbara, Christine, Carolyn, Rhonda, Julio, and all of those who raised their voices and asked their neighbors to do the same. • The City Commissioners who carefully considered all of the information presented to them since June 2014 and allowed this issue to be ultimately determined by Winter Park’s voters: Steve Leary, Ken Bradley, Sarah Sprinkel, Carolyn Cooper, Tom McMacken and Gary Seidel. • To our Library Board of Trustees (current and past), who investigated, researched, championed and advocated. 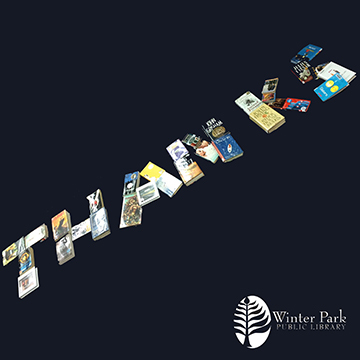 • The City of Winter Park staff members who shared their expertise and knowledge throughout this endeavor, especially City Manager Randy Knight. • City of Winter Park Library Facility Task Force - Sam Stark, Gary Barker, Chip Weston, Nancy Miles, Jan Walker, Daniel Butts, Joel Roberts and Jeffry Jontz. • The hundreds of residents who participated in our community enegagment sessions during this two-year process -- for their honesty and obvious care for the Winter Park community. • And last but certainly not least, to the Library staff who worked tirelessly to listen to our patrons and community, provide information, answer questions and provide the best possible service to our residents through it all. We look forward to engaging with our community as this project moves forward to be the project our city needs and deserve.